The most important 2-7 Triple Draw strategy for beginning and intermediate players is proper hand selection. In card games like Texas Hold’em or Omaha any two random cards have a better chance of winning than during a game of Triple Draw. This article covers some tips for selecting the proper hands to play in a game of 2-7 Triple Draw. We will also review the strategic benefits that being in position has during a hand of Triple Draw. Finally, I found a nice sample hand on YouTube where you can see a well played 4-way 2-7 Triple Draw hand. The rules of 2-7 Triple Draw make it so the best hand you can have is actually the the lowest (conventional) poker hand. Aces will count as high cards, while flushes and straights will count against you. 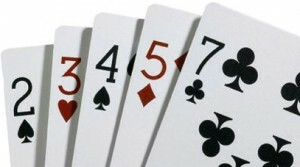 The best possible hands are made using five of the following six cards: seven – six – five –four – three – and two (but not as a flush). To start betting aggressively in Triple Draw, you will need a hand that contains at least a deuce and a seven combined with another low card. You will have three rounds to draw to a nut hand while being able to bet and put pressure on your opponents the whole time. Your position at the Triple Draw table is very important in deciding what your strategy will be. The best position in any game of poker is usually the late position, optimally the button. Being the one to act last is so powerful because you get to use the most information to your advantage. Each person that acts before you is going to tell you something about their hand by how many cards they draw or whether they decide to bet or not. This will allow you to accurately know how many cards you need to throw away and draw or maybe even just fold your hand and save some chips. The number of cards that you elect to draw should be a big determinant in how aggressively you bet during 2-7 Triple Draw. For instance, if you are drawing one or no cards, you obviously have a strong hand and should bet accordingly. The fewer cards that you have discarded, the more aggressive you should bet. If your opponents are drawing one or no cards, you can also discern that they have a strong hand and bet accordingly based on what you are holding. Whether you play an aggressive game or a more laid back and timid game is determined by the number of cards that you need to draw during each drawing round. For example, if you are standing pat or drawing only one card, your hand is obviously strong and your bets should be just as strong. The lesser the number of cards that you have discarded, the stronger your betting and playing style should be, and vice versa. The same goes for reading your opponents’ actions – if they are throwing down just a card or two or standing pat, they either have a strong hand or are attempting a good bluff. You’ll learn better how to be a good judge of that the longer you play Deuce to Seven Triple Draw. I found this YouTube video that shows a good sample hand of 2-7 Triple Draw. As you can see, there are four players still in the hand and the pro, Reg Brittain, breaks down what most “good” players would be thinking throughout the hand. This provides a good 2-7 Triple Draw guide of when you should stand pat, just draw one card, and even throw away two cards of an 8-high to take a small chance of drawing two lower cards. Players from the United States may have a hard time finding a 2-7 Triple Draw game online. Carbon Poker is the only room available that offers Triple Draw and has enough players to get the games running. It is on the Merge network, which has anywhere from 1,200 to 3,000 players logged in at a time. Most of these players will be playing Texas Hold'em or Omaha, but there is normally 1-2 tables of limit 2-7 Triple Draw being played. Non-US players have a better option with PokerStars, but citizens like myself from the United States are not allowed to play there. As long as you don't mind waiting a few minutes from the 2-7 Triple Draw tables to start, or can play another variant of poker such as Hold'em or Omaha; you will be happy at Carbon. You can support PokerTrikz and earn yourself a $750 deposit bonus with a 35% VIP offer by signing up for Carbon Poker today. Good luck at the tables. This article was submitted by my friend Josh. I may have done some quick edits, but the main content is his.